Joan deRyk Jones discusses the Railyard project at last week's town council meeting. 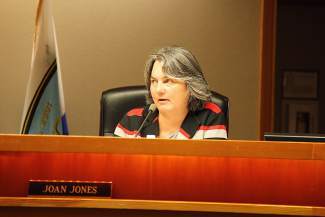 TRUCKEE, Calif. — Joan deRyk Jones will be the town of Truckee’s newest mayor next year. Truckee Town Council voted to reorganize its members at the Dec. 8 meeting. Jones, who serves as vice mayor this year, will replace Alicia Barr. Morgan Goodwin will be vice mayor in 2016, while Barr, Patrick Flora and Carolyn Wallace Dee will be council members. Jones previously served as Truckee’s mayor in 2012. Regular council meetings are held the second and fourth Tuesday of each month at 6 p.m. at Town Hall at 10183 Truckee Airport Road. The next meeting is set for Dec. 22. Visit townoftruckee.com/about-us/town-council to learn more.